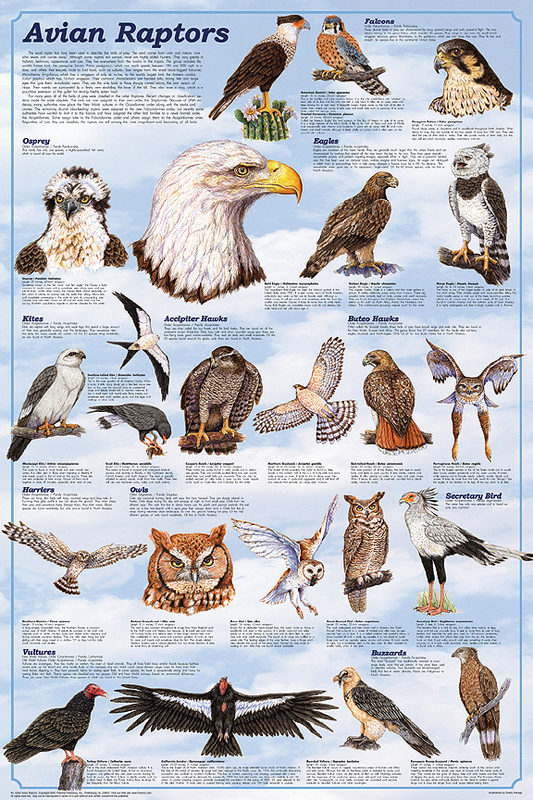 Avian Raptors Poster - the Birds of Prey: Hawk, Eagle, Buzzard, Falcon and more. It has long been known that modern birds are the last living descendents of the dinosaurs. This poster provides a comprehensive overview of the most dinosaur-like birds , the birds of prey. Magnificent illustrations show hawks, eagles, falcons, buzzards, harriers, vultures, owls and more. Each group has an introductory caption that summarizes its unique characteristics. Each bird is identified by both its common and scientific name. Whenever possible, North American species are shown. Great care went into selecting the flight poses as they reflect the hunting style of each bird.